The folks at Playground Games just announced that Forza Horizon 3, their excellent racing game, is about to get a crazy new Hot Wheel based expansion. This will be available on May 9 for $19.99 as a standalone purchase or as part of the Forza Horizon 3 expansion pass. 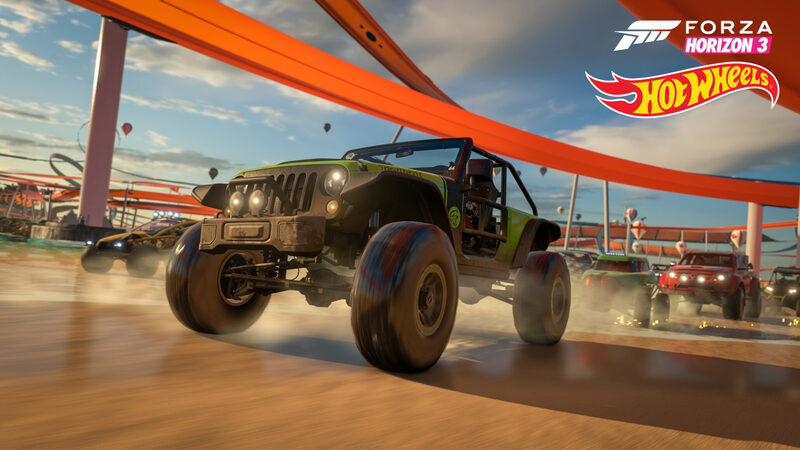 Forza Horizon 3 Hot Wheels takes players to six new themed islands located off the coast of Australia; all connected by a network of tracks – positioned hundreds of feet in the air – featuring classic configurations like loops, corkscrews, and more. This is stunt driving at its most extreme, where you can master tracks by performing brand new skills that make use of boost pads, high-bank turns, half-pipes, insane jumps, and even giant mechanical dinosaurs. If you’re looking to get creative, check out the new Stunt Swap feature to modify stunt track sections and dare your friends to try them. Explore the world of Forza Horizon 3 Hot Wheels in an all-new campaign, completing events on your way towards the ultimate stunt-driving test, an epic Grand Finale taking place on the massive new Hot Wheels Goliath circuit. Hook up with your buddies and compete in online multiplayer racing on tracks, or find out whose skills reign supreme in a brand-new Playground Arena. Along the way you’ll earn 28 new Xbox Live achievements worth 500 Gamerscore. Get ready to explore this expansion in ten new cars, including several Hot Wheels’ world-famous vehicles, as well as a brand-new Barn Find just waiting to be discovered and restored. Here’s a list of the ten new cars unlocked with the expansion.